Products in the Inactive status are essentially archived either automatically because they have gone over 30 days without inventory, or manually by the user. If this is the case, the SKU still exists but has been de-activated, or archived, so they are no longer listing anywhere. Zentail currently does not allow Users to delete products, instead, Zentail provides an option to archive a product so that the product can change or be activated in the future if necessary. 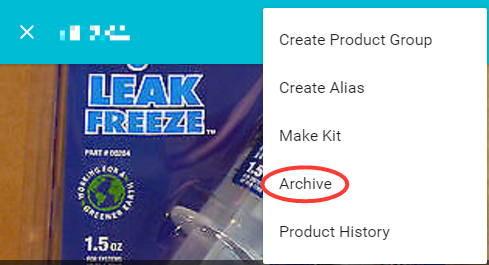 On the "Archive Product" popup that appears => Click "SUBMIT"
In the "Still in Catalog" column, enter "false" for SKUs you wish to archive, or "true" for SKUs you want active. Upload the CSV file and select the appropriate warehouse when prompted. Zentail has automated rules to archive or unarchive your SKUs. The goal is to make sure only current and active SKUs are on your catalog to provide a simple experience. Note: archiving a SKU will trigger Zentail to send an inventory update of zero units to the marketplace as part of the process to make the listing inactive.